Children & pediatric wheelchairs – how can we find one that is suitable? Attention must first be paid to the position of the pelvis because it is the most important point for the overall posture and additional functions. It is therefore important to stabilize the pelvis in an upright position. To do this, the child is seated, with his or her back straight and elongated, all the way against the backrest. This can be done only if the seat depth of the seat is appropriate for the size of the child (see page 7, “Seat depth”). If the seat depth is too great, the child will automatically fall into a position where his or her back is rounded. As a result, the pelvis tilts to the back and the buttocks slip to the front. This is exactly what is not wanted for a good fit. If the child is placed on the seat with his or her pelvis upright, the person accompanying the child should observe whether the child can hold this position on its own. If not, accessories such as soft pelvic harnesses, pelvis belts, etc. can provide passive support. Furthermore, lateral guidance must not be disregarded. The pelvis should have contact on both the right and left sides to provide further stabilization and informal perception. Now that the pelvis has the optimal position and guidance, the torso is sometimes able to show physiological responses on its own. These include upright posture, equilibrium behavior, improved head control and coordinated muscle reactions. Attention should now be directed to the presence or lack of stability in the child’s upper torso. There are several ways that we can give the child improved posture for training the functions. This is provided by the ways for adjusting the seat unit (seat tilt and hip angle) as well as by accessories such as lateral trunk supports, chest belts, etc. Always keep the following in mind when choosing care accessories: as little as possible and as much as necessary. An aid does not have to take care of what the child can already achieve. Here is an example: If the child has a good body posture, an H-belt is not required. Instead, the child should receive support in bodily functions that are weak or non-existent. 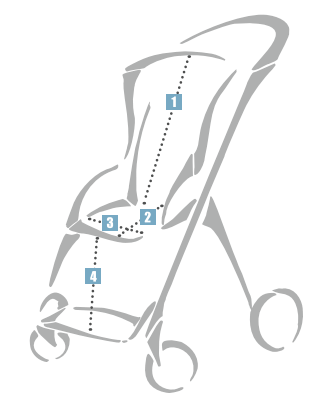 For example, lateral trunk supports provide stability for the child in case of insufficient trunk firmness.